We hope you guys are doing well. Scout is turning into an amazing dog. He's a bit over fifty pounds and is in perfect health. We've been through a few puppy classes and he was the star of the show. He's also unbelievably fast and agile. We are out in the woods a lot and it is common for me to see him doing a superman leap at full gallop over a downed tree. It's really something to see and we can't help but compare his moves and mannerisms to a horse. Anyway, dad likes to brag. Just wanted to send you a few updates! And tell you thank you for my precious baby girl! I love her more than words can say! She's so smart, loving, and SPOILED ROTTEN! And she is soon to be a big sister!! Today is Ryley’s birthday and to celebrate we made a cake. lol He is a wonderful boy, full of energy and love. He has many friends and loves to play. Quite independent, strong willed and may I say spoiled. His personality is unlike our last poodle Luc. Ryley is not shy nor afraid. He does not favour either one of us, we are just one big happy family. ha! We love him to death as he does us. Enjoy his first birthday picture. Hope all is well your way. Thank you for the lovely Christmas card. Very fitting. Chloe x Ozzy 2015 Purple Collar Male "Chevy"
We are loving this big teddy bear. And Chance and him are playing! Thank you for the card we received last week. I've attached a photo of our Emmi (Calleigh & Ozzy). She has brought us so much joy the past two years. Hi, Penny and Jeff! Thanks for your Christmas card! I hope your year has been a good one. We've had such a full year of learning, playing, worrying, training, laughing, loving with our Cocoa girl. She's a treasure beyond words. Thanks for letting her come into our lives. Here are my three favorite photos from the last six weeks, or so. Thank you so much for the holiday card we received today. I have to tell you that we ADORE that sweet Henna girl. She is a wonderful addition to our home. Hi Penny, Just a note to tell you how great Volt is!! He sleeps all through the night. Goes potty outside on command. Knows sit, touch, leave it, working on down. He is such a love and so clever. He and Lou are already a team. Just wanted to say hello, let you know all is going great! Clair is such a sweet girl , doing good on house breaking , had her 2nd shot on the 20th. She sure is growing fast has changed a lot in the last 2 weeks , with her being so fluffy she looks like a little Bear. Hope all is well with you and your pups . He is still as cool and calm as he was when we picked him up. He has been eating on schedule three times a day and drinking lots of water. Once we go to bed he usually makes it to 1 or 2 until he needs to go outside, then he goes back to sleep until 6:30 or so. We haven't had any accidents yet and he is responding well when we encourage him to "go potty". He is fine in the car, we were worried he might get sick but no signs of that. He's going up steps well, though he is nervous going down so we are taking that slow. He's playing well with his toys and has staked out a couple spots he likes to nap. 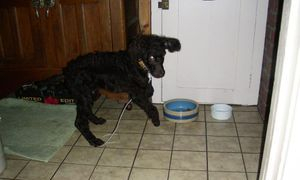 Our poodle has been trying to get friendly but she's a bit shy so they are dancing around each other. Our Bichon has been pretty snooty but today they started playing a bit so it should just be a matter of time for those two. We've hardly heard a peep out of the little guy, though he does have a cute little yip when he gets excited. Our whole family is thrilled to have the little guy in our midst. We are naming him Scout. d"Ar and I are closer than ever. People are amazed at how beautifull he is. He is also understanding more and more words. I just needed to send this as its been a long time. Thank you so much, you made our day. loves to play in the wood s, and on the beach, as you can see. We hope all is well with your family. At a year and a half old, Tippet continues to be a delight. She's a calm companion in the house, an animated runner and player in the presence of other dogs, and in her first year in the field, a credible pheasant hunter – though she's now decided that retrieving birds is unnecessary. We'll work on that. And on not eating the drip irrigation bibs…. Just a quick note to let you know Ryley did very well at his first visit to the vet. He was well behaved and the vet was thoroughly impressed. He is now approximately 22 lbs. so has put on about 5 lbs. since you last weighed him. He eats like a horse and runs it off just as fast. ha! Next shots will be on May 26th. He his growing quickly and is a very active young boy. The vet said it would be alright for him to meet other dogs and to socialize a bit. Here are some pictures to show you. We are very proud of him. Hello Penny. Sending along a pic of Rusty (with our son and his girlfriend). He has made himself comfortable in our home and we love him. He gets lots of exercise, daily walks and visits to the dog park, and everyone in the neighborhood is getting to know him. 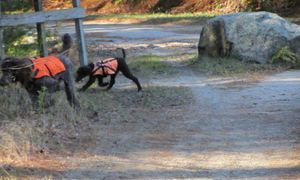 He especially enjoys the days he runs into a young labradoodle named Harpo--they go crazy running circles around one another. He does torment the cat, but not in any aggressive way--he just thinks it's lots of fun to chase the cat (though it's not so much fun for the cat...) The cat tolerates him and just finds him annoying. Anyway, he's doing great, and we'll send along other pics from time to time. Thank you for sending us this wonderful dog! Thought I’d send a couple of pictures to show you. Ryley is doing really well. He has mastered the stairs coming up all by himself. Still working on going down. He loves to be outside and sometimes it takes a bit of coaxing to bring him in. Not the case when he hears the coyotes howling. We changed kennels and now have a larger one. He sleeps in the kennel at night and when we are out. A little fussing but for the most part doing really well. We have made his first vet visit on May 4th. Until then he stays pretty close to home. He is a bundle of joy and need I say a bundle of energy. Keeps us on our toes that is for sure. Talk soon. Rose x Spencer 2011 Black Collar Male "Woody" and Rose x Spencer 2013 Yellow Collar Male "Newt"
I trust all is well in your home. Sydney & I enjoy the postings of all the poodle news. We thought you would enjoy seeing this little write-up about Woody & Newt being named Co-Dog of the Month at Riverdog in Issaquah. Our guys have brought joy to hundreds if not thousands of people they have met in the last 3 ½ years for Woody & 2 ½ for Newt. They are the joy of our lives. Thank you for all your efforts to bring wonderful poodles into the lives of many others. Keep up the good work. Leo is very, very loved. He has been a blessing. He has slept through the night since day one. He goes into his crate at bedtime, has been waking up only once between 2:30 & 4 to go potty, then lies in bed w me( Eric leaves for work at 4) until the kids wake up. We've had a few potty incidents inside, which we knew would happen at some point his first few weeks. Aviana and Alexander felt so proud and overjoyed about working with him on climbing the stairs. They actually made progress today. I just can't tell you enough, how much we have bonded in just these past few days and how very much we love Leo. As Ransom rounds out his first 48 hours here, I had to write and compliment you both on the wonderful poodles you breed and raise. I cannot imagine a puppy having a better temperament, and I have to keep reminding myself he's not quite 4 months old. He walks perfectly (better than my grown dog!) on leash. When he encounters a strange sound - and I have the feeling so many sounds here in the city are strange) - he is initially startled, but he doesn't stay scared and then wants to go investigate. He wants to meet every human we go by, but not in an annoying, spastic kind of way. He just stands patiently and waits or even sits down. He's loving and cuddly, but confident and not needy. And he took to Toby and the cat immediately. He is really about the most perfect dog I've ever met. A couple times I've come home and found him barking in his (large) crate. Jenny has been out of town this week, so I imagine he gets a little separation anxiety when the only person he knows here is gone. I followed the advice in one of Ian Dunbar's books ("Before and After Getting Your Puppy" is excellent). When I put him in the crate, instead of just putting him in there with chew toys, etc., I sit on the floor and gently say, "Ransom, settle. Settle..." and talk to him softly and pet him until he calms down, which takes maybe 5 minutes. That seems to have solved the problem. Dunbar says one of the best things a dog owner can do is teach his puppy to settle, and I'm happy with the results thus far. I just wanted to thank you again for your efforts. I was (and remain) sad about Victoria Law's death because Toby is a great friend and has brought me so much joy, but I'm happy to know that people like you are doing such great work. Please let me know if I can ever serve as a reference or anything. I've been trying to work from home this week to help Ransom get acclimated, but as you'll see from the attached pics he does not make me very productive. Ransom and Toby having a great time. Our dog walker met him today and said she is astounded by how mature he is - she said "that's a one in a million puppy". Truly, he is amazing. Two boxes arrived today safe and sound. Thank you for so many wonderful toys! That's very generous of you. I'm going to bring him some water and a chew toy and some liver treats for when I pick him up so he feels welcome. I swear on my life that Toby knows something is up because he's been soooo clingy. We have a plan for making sure he gets lots of attention, too. He is so laid back...I think he is going to love having a brother. Thank you so much for everything. I'll hardly sleep tonight! hi Penny wanted to let you know that Red is doing great. Learning more each day. Trusting us and even the mean old cat. He is perfect on a leash, great off leash too. He went on a 100 miles car trip and was great. He is cheerful at all times and he is the dog we have dreamed of having. We take him to classes in May. my goal is to teach him to retrieve the newspaper like the dog you told us about. Thank you for all you did to make him such a well adjusted puppy dog. Hi, Penny and Jeff! Yesterday, I took Cocoa to her first grooming session since she joined our family. Wow! 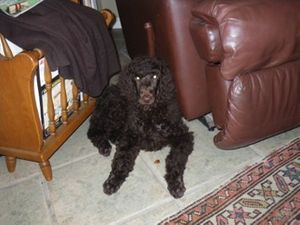 I may have had the groomer go a little short on the cut, although Cocoa doesn't seem to mind her sudden "skinny" look. The groomer has been grooming for 34 years, loves poodles, and loves puppies, so--even though she's not taking many new clients, anymore--she consented to take Cocoa. She let me watch everything and showed me the ropes so that I can learn to do it, myself, if I want. I had thought I would, but after seeing all of the nooks and crannies that are included, I'm not so sure. The groomer, also a Penny, was very impressed with how Cocoa behaved and with how well her breeders had prepared her for the world. I thought I should pass that along! I'll attach a photo of our skinny girl. Penny, Red is doing so well. He goes happily into the crate now. He loves walks. So far no cat collisions. I know you were wonderful to him and that is why he is confident and happy. We finally decided on a name: Anna. you for all the work you did with her. She is wonderful. of love and cuddling and today she is much more energetic and playful. our hearts so much good. Driving to SFO took 2.5 hours with insane traffic and a flooded freeway, but her dogship is now home. Seems to love the back yard but it's now too dark to let a brown dog out until morning. Peed but didn't poop. She's found a place on the floor by the leather chair that she seems to like better than her crate and curled up, snoozing, occasionally watching me at table and lap top. Happy to greet me if I get down on the floor but otherwise still shy. Ate some dinner but drank no water which is there for her. I'll let her out at 10 or so and see how it goes until morning……. Hi Penny: Here is a not very good photo of Hunter. He was eating and I called his name to get him to turn his head, but instead he leaped around, ears flapping and came running to me, and I caught him mid-air. He is doing great at coming when called. He is also doing great on leash walking, and starting to respond to sit. We went to our vet on Monday and he was very pleased with what he saw. I explained all that you did for us in terms of working with Hunter before we picked him up and the wonderful care package you gave us to take home. He was impressed. Thank you. Hunter has been very mellow and easy to work with. Our vet wants us to begin working on his socialization with people and known dogs, but no parks or dog parks or walking where heavily used by dogs. So we are taking short walks near home, being careful where we go, and taking the opportunity to introduce Hunter to our great neighbors. We have a fairly new puppy next door and an older puppy two doors down, so we may setup a play date soon so Hunter can get better acquainted, if the weather cooperates.